This is what Jesus tells the disciples, in response mostly to questions from Thomas, at the end of our gospel. That’s a pretty big promise. Has Jesus been keeping it? How many times, do we ask for something in our prayers that doesn’t come true? How many times do we feel let down by our faith? 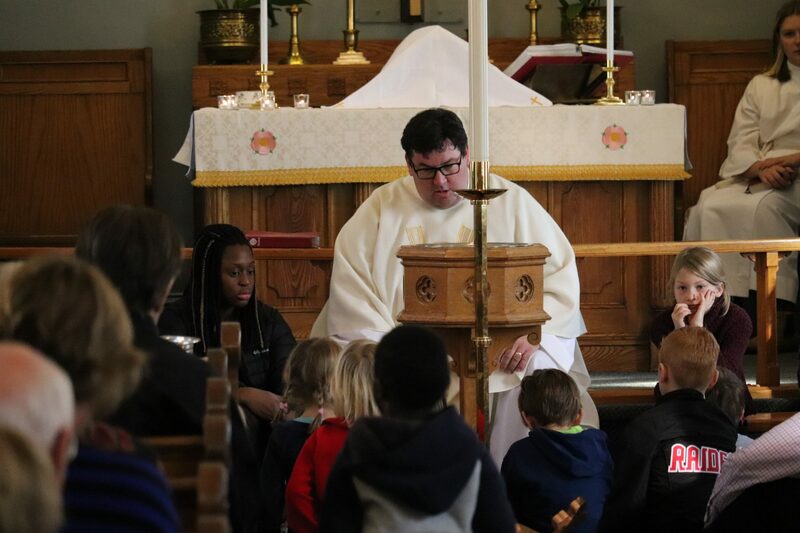 At a time in Canadian society when religion is so often portrayed as an unreasonable belief, one held only by people who don’t think deeply of the world, we often do this ourselves as well. We reduce faith to a contract: ask Jesus for something and he’ll take care of it for us. Religion made the front pages this week, and behind the politics involved, it was a deeper theological discussion than often happens. Liberal Leader Justin Trudeau, as you will know, announced that new candidates for the Liberal Party under his leadership would have to be pro-choice. He was criticized for it, for various reasons, but most vigorously by the Roman Catholic Church, the faith in which he was raised. A few days later, Trudeau responded, and it’s this response that I think reveals the inner wrestling with our faith that we all experience. Trudeau cited his father, a devout Catholic, who had raised his children by reading them the Bible, who attended church every Sunday, who defined himself, in part, by his Catholicism. He had his personal views on controversial topics such as abortion and gay rights, Trudeau explained, but as a leader, his father decided he had to speak for everyone – that he had to defend the rights of everyone. In other words, he could think personally, but he had to lead globally. That’s an interesting faith question, isn’t it: if we have our personal beliefs as dictated by our individual relationship with God, and our own interpretation of the Bible, do they mean anything if they don’t also determine our public path? If we stifle them, or edit them for others, isn’t that cheap faith? In fact, Jesus lays out a very clear blueprint for this kind of faith. We have in the Old Testament the Ten Commandments – which are essentially a ten-step guide to live properly as individuals. Taken together, the Ten Commandments create clear rules for how human beings can live peacefully in community. But they are strict edicts – commands – to each of us, one at a time: YOU shall not lie. YOU shall not kill. YOU shall not covet your neighbour’s possessions, or dishonour your parents. These are useful prescriptions, certainly, but they are also strictly focused on what NOT to do. They ask us to look inwardly upon ourselves and our actions: How has what I have done hurt someone else? How has what I said brought dissension to others? How have I been responsible? If we strictly followed only the Ten Commandments – which is, I think we will all agree, impossible – we would no doubt live good lives, but they would be shaped by what we had been careful NOT to do. We could hold firm to our personal view of faith – and allow that to shape our individual beliefs on topics such as, yes, abortion. We could ask for the strength to NOT do wrong and we could even ask it in Jesus’s name, and if we never left our homes, or spoke to anyone else, we could manage. But we don’t live that way. We can’t only think personally, and live globally, let alone lead globally, which is why Jesus gives us the one, overarching commandment: to love one another. Think of this commandment not as the foundation upon which the other ten exist, but as the umbrella at the top that holds out the rain, which reaches out beyond us, and which really does the heavy lifting. This is the commandment that is not focused on what NOT to do, but stresses what we SHOULD do, what we MUST do. It takes our faith from an inward relationship with God to an outward contract with the world. In this way, we may reconcile our personal beliefs with God: we may feel for ourselves that certain understandings are true for us, but we always have to look up at the umbrella, which extends farther than ourselves. Abortion is a good example of this complex position. I know many women for whom having an abortion personally would be inconceivable – at least in an abstract conversation – but who find no contradiction in supporting the freedom of other women to make their own choices. Our faith, as Jesus intended it, is both personal and communal; it recognizes that we wrestle daily with our mistakes, but also requires us to think about what we do for others. How are we making the world better for others – as opposed to just not doing harm? How are we spreading the truth of the gospel, as opposed to not just telling a lie? Cyberbullying is a modern example: Say you are online, and someone in your group starts bullying another person, spreading lies about them. If you say nothing, then you have kept the commandment not to lie. You have not spread hate. But if you say nothing, you have failed to uphold the most important commandment: by not speaking up, by not protecting another person from harm, you have not acted with love. An umbrella without the part that keeps out rain, that protects us from the storm, is just a stick. And that’s an interesting analogy because the Ten Commandments have, in history, often been used as exactly that: a stick for whacking those who don’t agree with us. For anti-abortionists to stand outside clinics, waving signs, while young, often grieving women sought help with a difficult problem. For people to pass judgment on those who were divorced. To keep children in line even when it was harmful to them. The commandments are intended to be a stick, but only for ourselves: not to use to ostracize or shame others. In the end, we must balance both, and we must explore both sides of our faith and our beliefs: Our personal wrestling with issues, even when our opinions seem out of favour, and our public duty, as followers of Jesus, who embraces the outcast, who loves the supposedly unlovable, to look first with tolerance and openness. It helps to ask: Were I them, what would I most need? Jesus says: I am the way, and the truth and the life. To get to God, you go through me. I understand Jesus to be saying; to get to God, you live like me. You follow the example I have set. You do as I have taught. And when you ask things – truly in my name – thinking first of others with love – anything is possible. That is the way that Jesus describes, that we reach out in love toward others, as surely as holding an umbrella in the rain. Amen.